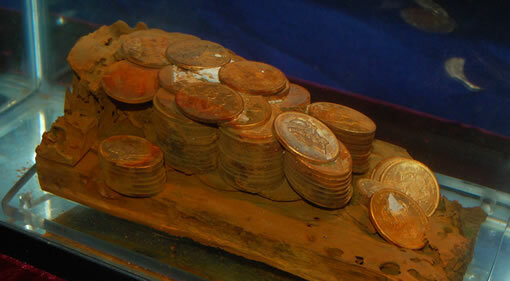 The incredible "Ship of Gold" exhibit, showcasing California Gold Rush-era sunken treasure recovered from the 1857 shipwreck of the SS Central America, will make port in Boston at the American Numismatic Association’s World’s Fair of Money, August 10-14 at the Hynes Convention Center. The exhibit is courtesy of Monaco Rare Coins of Newport Beach, Calif. The SS Central America was recovered in 1988 from nearly 8,000 feet below the surface of the Atlantic Ocean. The ship sank in a hurricane in September 1857 while carrying California gold from Panama to New York City. The exhibit also includes one of the 13 recovered octagonal $50 gold pieces produced by the United States Assay Office of San Francisco, and the remains of a wooden cargo box that still contains approximately 110 Double Eagles as they were found on the ocean floor. Many appear to be 1857-S $20 gold pieces, apparently freshly struck at the San Francisco Mint when they were placed in the container for shipping. Visitors will see the front pages of three 1857 newspapers that published stories about the shipwreck, the ordeal of survivors and the devastating economic effects created by the loss of the gold. Robert Evans, the chief scientist on the 1980s mission by the Columbus-America Discovery Group that located and recovered the magnificent sunken treasure, will be in Boston to meet visitors and discuss the SS Central America, her cargo, crew and passengers.